I'm sitting in a BBQ joint in Oregon, Ohio. Just outside of Toledo. Why am I here? Because I didn't want to drive the extra five miles into downtown for dinner. In daylight, it looked sketchy. At night? I'll stick with Oregon and Q.
Toledo, mes amis, is depressing. Wow. Gray, industrial, and just meh. My hotel is brand new and nice. The customers are nice, but it feels a little like there's some subtext that I am missing. So here I am waiting on a barbeque salad. Before I went to the cafeteria for lunch, I Googled "How depressing is Toledo?" Yes. 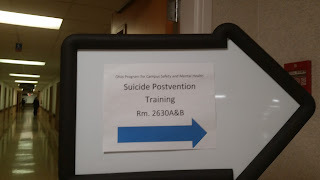 It says Suicide POSTvention. I looked it up. It's a dumb way to describe aid/support to people who lost a loved one to suicide. It's awkward. But also...a sign. No. I'm not suicidal. It's just an answer to the depressing Toledo question. I'm sure that my next set of trips to Newark NJ, Decatur IL and Lodi CA should be uplifting. Could be worse. Could be Bakersfield. What the F is a barbeque salad? I'm hardly a native Texan, but that offends my ears. Or eyes. Whatever. A green salad w BBQ meat on top of it. In my case, pulled pork. I've been to Bakersfield. It sucked. Toledo sounds sort of depressing. I've never actually been to Ohio at all. My baggage has, though. More than once. Most misdirected luggage on airlines ends up in Ohio, it seems. Or maybe it's just mine.